Engineers from Yale University have developed a new technique to control the frequency of single photons. The ability to control the frequency of single photons is crucial to realize the potential of quantum communications and quantum computing. The current methods for changing photon frequency, however, bring with them significant drawbacks. Researchers in the lab of Hong Tang, the Llewellyn West Jones, Jr. Professor of Electrical Engineering & Physics, have developed a technique that avoids these obstacles. The results of their work are published today in Nature Photonics. Linran Fan, a Ph.D. student in Tang’s lab, is the lead author. Currently, the most common technique for manipulating photon frequency is with what’s known as nonlinear optical effects, in which a laser essentially acts as a pump, changing the photon frequency by providing extra photons to mix with the original one. The effect is weak and probabilistic, though, so the process requires a very strong laser, which that creates “noise” – the loss of certain quantum properties. Using a completely different technique, the Tang lab demonstrated a capability to change photon frequency by up to 300 GHz without creating any noise. 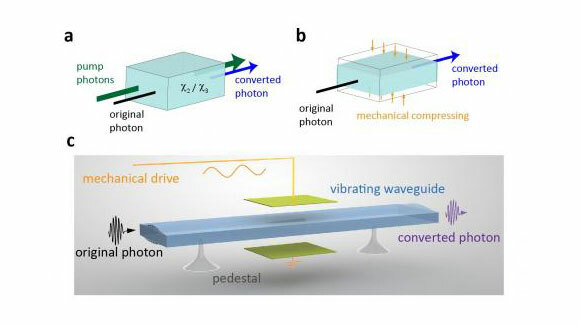 Instead of using nonlinear optical effects, the researchers change the frequency of the photon by changing the photon’s propagating medium – the material in which the light travels. The structure that guides the light, known as a waveguide, is rapidly modified while the photon is in it. This allows the researchers to stretch or compress the photon and change its frequency. It’s a difficult process, Fan said, because the researchers need to change the structure enough within a very small time scale, and the change must happen exactly as the photon enters the waveguide. Be the first to comment on "Yale Engineers Advance Quantum Technology With Photon Control"